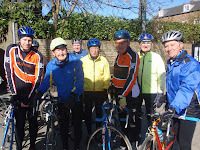 PONTELAND IS A FAVOURITE VENUE for CYCLISTS to meet before heading off onto the byways of Northumberland. A group meets on Sunday mornings, divides up into speed kings and the not so speedy and afterwards the two lots meet up at Stamfordham for their food. This picture was taken on Bob’s 86th birthday – that’s him in blue on the left. Metal Mick was also with them, he has two new knees and a hip.